Buckingham Palace has released a new photo of the Queen and Prince Philip to mark their 70th wedding anniversary. The couple married at London's Westminster Abbey on November 20, 1947, just two years after the end of WWII, in a lavish ceremony attended by statesmen and royalty from around the world. She is also wearing a "Scarab" brooch in yellow gold, carved ruby and diamond which Philip gave her in 1966. Elizabeth has been married for far longer than any other royal, and the newly-released picture showed the couple framed by Thomas Gainsborough's 1781 portraits of George III and Queen Charlotte, who were married for 57 years - the second longest royal marriage. 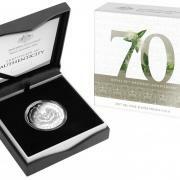 Two collectible limited-edition 50 cent coins have been released in Australia to celebrate the anniversary. 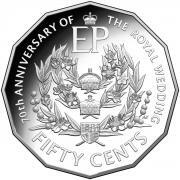 The Royal Australian Mint has produced 5000 silver coins and another 30,000 made from cupro nickel featuring the royal couple's monogram EP, floral wreaths, myrtle blossoms, and sprays of wattle. 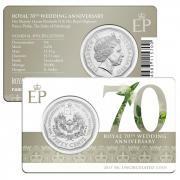 "The design features symbolic references to family, marriage and love, celebrating the enduring union of Queen Elizabeth II and Prince Philip," the Mint's acting chief executive Sarah Polhill said. The Queen and Prince Philip plan to celebrate their platinum wedding anniversary on Monday with a private dinner among family and friends at Windsor Castle.